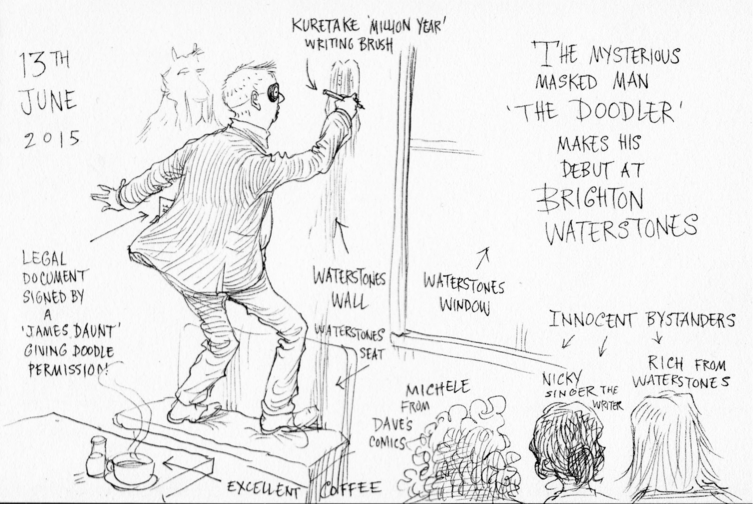 This is the afterword to my novel Island – explaining the genesis of the story, my chance encounter with Chris Riddell and my gratitude to all my amazing backers. So many people have nurtured Island. It’s a tale of chance remarks, serendipitous meetings – and incredible generosity. Let me begin at the beginning. The day when Associate Director Anthony Banks rang me up and asked if I’d like to write a play for the National Theatre. There was a silence my end of the phone. ‘That you’d better start straight away,’ said Mr Banks. I came to believe the island was a microcosm for the impact of global warming; the graves opening because of the melting of the permafrost. But I needed to get my facts right – on this and many other things. The Canadian scientist the Rose family had travelled with was Professor Christopher Burn. A fount of information and kindness, he skyped and e-mailed answers to questions as diverse as ‘what sort of people become arctic research scientists?’ to ‘are there pea pods on Herschel?’ For the record, all the scientific information in the book, including the flora and fauna is – to the best of my knowledge – accurate to the island: much of it gleaned from Chris’ own wonderful book Herschel Island: Qikiqtaryuk: a Natural and Cultural history of Yukon’s Arctic Island. (Any errors are mine, obviously.) Two other books also became primary sources and great loves. Hugh Brody’s compelling work The Other Side of Eden based on his first-hand experience of living with hunter-gatherers and Arctic Dreams by Barry Lopez, a book of astonishing beauty about Northern landscapes and people. It didn’t seem so very long before I was in a rehearsal room. What a surprising place that was. The creative journeys of a novel and a play are very different. For a novel, you go into a dark, solitary space with a piece of grit to emerge approximately (in my case) eighteen months later with a small pearl. Whatever lustre the pearl has – or doesn’t have – is down to you and you alone. You are the king or queen of the dark, solitary space and no-one has powers there but you. Imagine such a queen coming into the rehearsal room and finding a bunch of other creative people there. Nice – but what are they doing in your work-space? Imagine such a person having to bring her pearl – when it’s still very much a piece of grit – and put it on the table for these other people to inspect. That’s what it’s like for the novelist turned playwright. Scary. And exhilarating. Because – actually, the people in this room are amazing. Director Adam Penford, interrogating the script line by line. Designer Simon Kenny, bringing new colours and textures – the island sewn together with animals skin. Sound designer Tom Gibbons making music from sounds you’ve heard before (breaking ice like pistol shots) and sounds you haven’t – the call of seals zapping through water like electronic arrows. And then there are the actors – Rebecca Boey as Inuluk, Jilly Bond as Pascale, James Cooney as Cameron and Anne Kavanagh as Grandmother – each of them breathing full life into your pale, shadowy characters. I nearly left the planet with excitement. Bit of a shock that, for a novelist. You see, we’re used to leaving traces. Quite fat 250 page traces. But I let it go, moved on. Until, that is, about a year later when there was a sudden flurry of newspaper articles about the melting ice-caps. Five people rang me up in the same week. ‘What happened to Island?’ They asked. I realised I still had things to say about the subject. So I began again. And I fell in love with my characters – again. I also liked the extra space in the book, it allowed me to add in some detail that didn’t make it into the play. All in all, I thought I made a pretty good fist of the re-write. The publishing industry disagreed. ‘It’s too quiet,’ they said, ‘for the current market’. I’m not sure this particular term has made the OED yet but, roughly translated, I think it means: ‘this book will not make a shed-load of money’. Leaving aside the fact that if publishers really knew what made money eight of them wouldn’t have turned down Harry Potter, they are, in Island’s case, probably right. But then I didn’t write Island to make a shed-load of money. I wrote it because it seemed a story which still needed to be told. Cue Ursula Le Guin’s blistering address to the US National Book Awards last year (https://www.youtube.com/watch?v=Et9Nf-rsALk) where she talks about the difference between ‘the production of a market commodity and the practice of an art’. She goes on to wonder at us – the writers and creators – ‘who let profiteers sell us like deodorant and tell us what to publish and what to write’. She finishes by demanding, not shed-loads of money – but freedom. What might this freedom look like for someone like me? To be able to publish what I hope is a powerful, meaningful story in powerful, meaningful language. For young people. Yes – young people. Which is another problem. As well as being ‘too quiet’, Island was also deemed ‘too literary’ for these apparently lesser mortals. I’ve felt this chill before. Not least when I was asked to expunge the word ‘bonnet’ from a previous novel on the basis that no self-respecting 12 year old would know such a word. The publisher was unmoved by my assertion that, at the same age, I was required to be able to spell and define words like ‘sinecure’. Does this matter? I think so. Put simply, we think in language. It there isn’t a word for something, or that word is not in our vocabulary, it impairs our ability to know – and also to communicate. Which is one of the reasons I have had so much joy (nuannapoq even…) with the Inuit words in this book. So what do you do when your book is too quiet and too literary for the current market? There seemed to be three options: 1) lie down and die (only I’m not very good at that); 2) lie down and die (I seriously considered it); 3) put up or shut up. I decided on 3) and began researching crowd-funding platforms. What if I could reach a whole new community? A cross section of people who cared about children’s literature and also about the planet? I started to put together a Kickstarter campaign. And thanks to people who know considerably more about social media than I do (thank you Candy Gourlay, thank you SJ Said) word began to get out. The book you’re holding in your hands is the result of that power – people power. And also of trust. People trusted me. (That was – and remains to me – pretty humbling). And perhaps it’s also the face of a brave new world where publishing (and what can be successfully published) is gradually, but fundamentally, changing. Where we might be looking be looking, say, at a new – international – version of the 18th century subscription model? But let’s return to the heroes of this particular story. The people listed below who actually made this project happen: my family; my friends; people from the world of children’s books (editors, agents, translators, writers); librarians; teachers; environmentalists (workers, activists, writers, advisors to government); musicians, composers, theatre-makers, film-makers, the odd lawyer, a totally non demonic banker and also names that will be as unfamiliar to you as they were to me – that incredible band of generous strangers from all over the world who took a risk on me. I thank each and every one. ACHUKA; Nina Allan; Noga Applebaum; Laura Atkins; Adam Baghdadi; Helen and John Barnes; Philip Bartle; Mandy Beall; Susan Benn; Don Black; Rebecca Boey; Jilly Bond; P.S. Brooks; Mark Burgess; Tom Burke; Christopher Burn; Tim Burnett; Alex Burton-Keeble; C.J. Busby; Moira Butterfield; Dawn Casey; Liz Casey; Kops Chow; Miss Rachael Claridge; Jo Clark; Catherine Coe; Conville and Walsh; James Cooney; Chris Cooper; Liz Cross; Linda Daunter; Sue Downie; Alan Durant; Ros Edmonds and family; Daniela Essart; Felix Faber; Robert Faber & Kim Pickin; Ian & Sarah Farringdon; Tia Fisher; Janet Foxley; Philip Franks; GD; Vanessa Gebbie; Debra Goodman; Paulette Gordon-Stewart; Candy Gourlay; Lynda Graham; Maxine Gully; Daniel Hahn; Jan Hall; Henny; Lucy Hooberman; Deborah Holmes; Monica B Holmes; Paul Hudson; Alexandra Jackson Kay; Beverley Johnson; Siân Jones; Anne Kavanagh; Simon Kenny; Liz King-Smith; Ann Kronbergs; Sharada Laidlay; Joost Landgraf; Katherine Langrish; Trisha Lee; Lennhoff Family; Bronagh Liddicoat; Jen Lunn; Will Mabbitt; Kristin Mason; Geraldine McCaughrean; Katharine McEwen; Noella Mingo; Jonathan Monk; Nicola Morgan; Lucinda Morrison; Adele Moss; Miriam Moss; Charlotte Mulliner; Beverley Naidoo; Katie Naylor; Valerie Niblett; Stine Nilsen; Jude Obermüller; Mary Parker; Guy Parker-Rees; Esmé Patey-Ford; Deborah Perkin; Lesley Parr; Clare Paterson; Lucy Pearce, Womancraft Publishing; Lola Perrin; Julie Pike; Fabrice Piwnica; Cindy Polemis; Pop Up Projects CIC; Emily Precious; Jacquie Pritchard; Phil Pritchard; Richard; James Riley; Charlotte Rivington; Amy Rogers; Frances Rose; Martin and George Rose; Mandy Rutter; SF Said; Nikki Sheehan; Jo Sheldon; Colin Singer; Jackie Singer; Janet Singer and Alan Edwards; Stephanie Singer; Molly Singer-Kingsmith; Edmund Singer-Kingsmith; Roland Singer-Kingsmith; Francesca Singer Smith and Mr Tom Ince Esq; Arthur Slade; Shelley Souza; Kay Stephan; Roger Stevens; Gloria Sullivan; Jan Sullivan-Chalmers; Luke Temple; Sarah Towle; Jaime Unson; Eleanor Updale; Janet Waddicor; Jenny Waldman; Sue Wallman; Hope Estella Whitmore; Rupert Widdicombe; Caroline Williams; Claire Williams; Nigel Wilson; Debbie Wiseman. People on (and off…) this list put in different amounts of money. Many put in more than they could afford. One person put in an insane amount of money. He thought I wouldn’t know, he thought donations were anonymous. Bad luck, PG! Some people gave me other things too – things that money can’t buy. Writers Dawn Casey and Bille Eltringham gave me hope as well as detailed feedback on the manuscript. Michael Rosen (who I bumped into at the Brighton Festival) gave me gracious permission to quote from I’m Going on a Bear Hunt – a total favourite in our family as well as in Cameron’s. Agent Clare Conville read with her perceptive, critical eye – as always. Tolly Rose provided photographs of lavatories and doors into other universes. Georgie Gadian, Aged 11(nearly 12) – her brackets (true say!) promised trenchant feedback on the story – but stopped scribbling after page 20 when she got ‘carried away with reading’. That’s the nicest sort of feedback, Georgie! Last but by no means least, is Karen Jones’ class of cinquièmes at the bi-lingual ASEICA school in Nice who graded my re-write Mention Très Bien. And then, in the midst of all the excitement, I have a Massive Loss of Confidence. …and what if I’ve written a turkey, after all? My head is hurting. I can’t work. I take myself off to Waterstones and I’m just sitting there with my cup of tea and Someone Else’s Book (oh blessed relief), when this vandal comes in and starts drawing on the walls. He says his name is Chris and he’s allowed. The pictures are quite good. In fact they’re very good. 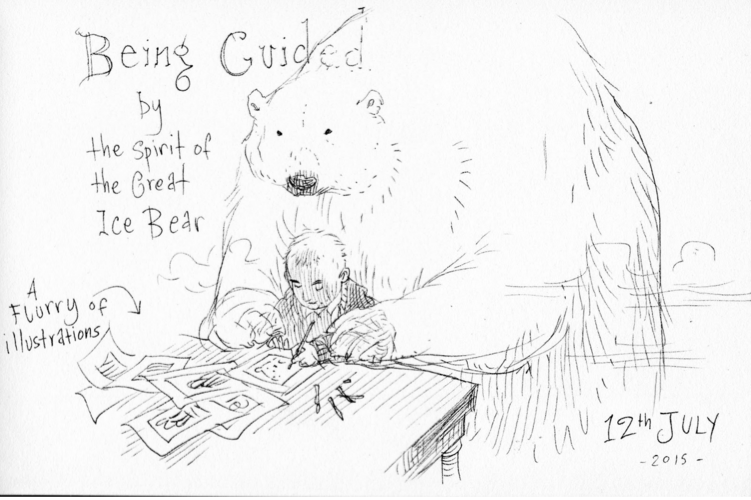 Which is not surprising on account of the fact that he turns out to be the illustrator Chris Riddell, newly appointed UK Children’s Laureate. And I send him the book and a little while later he writes me: Just finished reading your beautiful text and am now rather in love with ‘Island’. And after everything that has gone on, you will understand why this makes me cry. 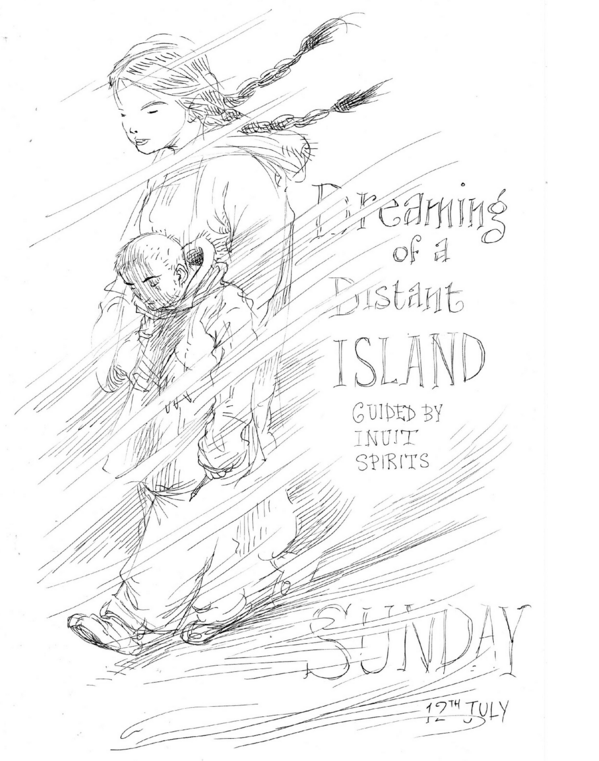 Chris has lots of other work to do – some Laureate work, the small matter of a Neil Gaiman book to illustrate… but he makes time for Island and even posts about it. And then he sends me the real pictures. The ones you see in the is book. Well – I don’t think I have to add anything to them. Except – perhaps – thank you, Chris. Thank you SO much. Although, for the record, you should know that Chris is donating his share of any proceeds to Greenpeace. Which just shows you, if you needed any further evidence, what sort of man he is. And finally we have Charles Boyle and Trevor Wilson. Charles is a writer. I first spotted him writing (poetry) at his desk in the dull office we shared in our early twenties. He now runs the tiny, award-winning, independent press cbEditions which he still operates single-handedly from his front room. Charles is a tireless champion of homeless literature: poetry, short fiction, translations, the lost and the forgotten. It was Charles who first offered to take Island under his wing. And it’s Trevor, of Caboodle Books, who has put in the extra money to extend the print run so there will be books in bookshops and available to share in schools. Trevor also runs Authors Abroad and, with this hat on, he will help put me in those schools so the discussion can finally start with the really important people – the children. And who made that happen? I have been a fan of yours since I discovered you almost ten years ago. And just wanted to say I admire your integrity – indeed a rare quality in our time. Keep writing your great books and staying true to yourself. I am a big fan of your “ISLAND” and I hope I could read this wonderful book in Japanese. So, I recently contacted a Japanese publisher that have published several books by cloud funding system to ask if they are able to publish the Japanese edition . Please pray that my dream comes true. Thank you for your reply. There are two reasons. I love my mother tongue and I really want Japanese young readers to enjoy your ISLAND, such a wonderful book! 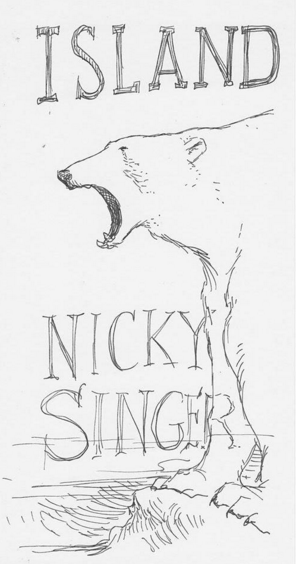 The publisher I mentioned before has been trying to contact the copyright proprietor of the book for two months. But they don’t have a reply yet, so it seems they aren’t interested in publishing Japanese edition. It is disappointing a little bit but I will keep recommending it. Does This Bomb Cross Your Boundary?